Three ingredients and a garnish of chives - this buttery potato bake is the perfect side dish. The simpler, the better! Rinse potatoes; pat dry with paper towels. Brush 1 Tbsp. margarine onto bottom and up side of 9-inch pie plate. 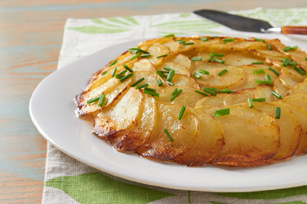 Toss potatoes with remaining margarine and 1/4 cup cheese; layer on bottom and up side of pie plate. Sprinkle with remaining cheese. Bake 1 hour or until potatoes are tender. Loosen potatoes from side and bottom of pie plate. Invert immediately onto plate; top with chives. Cut into wedges. Prepare using any all-purpose potato.